We are St. Louis Wildlife, Inc. a full-service wildlife removal company servicing the greater Saint Louis MO area. We resolve conflicts with unwanted snakes. When Can You Solve My Snake Problem? Common problems caused by snake include: most commonly fear of snakes is the biggest probem. 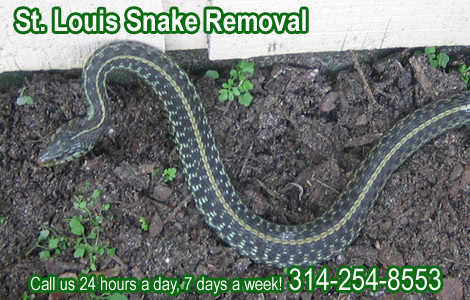 Our company specializes in wild animal control, including St. Louis snake removal. Venomous species in Missouri exist, but are rare. We are not a pest control company, or an exterminator. We deal strictly with wild animals. We are also not the Saint Louis county animal control, and we do charge for our services. The Red Rat Snake - The Red Rat Snake, or the Corn Snake as it is known in many areas is a common species of snake which can be found across the central United States, including Saint Louis. This non-venomous snake is one which has become very popular as a pet because it is reluctant to bite and can be very docile. The Latin name Pantherophis guttatus guttatus is how it is known in scientific circles, but for most people this snake is one that is very unlikely to be dangerous, and can often make an ideal pet. Appearance And Diet - These attractive snakes are an orange-red for most of the body, with darker colored orange-brown saddles bordered with black appearing regularly down the body. They can grow up to six feet in length, but will usually be between four and five feet in length. Because they have been domesticated for many years, those who are buying a Red Rat Snake as a pet may find that they don’t actually buy a red snake, as there have been many color variations and mutations to change the appearance of the snake. As with all snakes the Red Rat Snake is a carnivore, and generally kills its prey by constriction. As the name suggests, it will most often eat rats and mice, and was dubbed a ‘corn snake’ because it was often found in the area surrounding a corn shed because that was where the highest population of mice and rats was to be found. Behavior And Habitat - The Red Rat Snake is very docile and calm when encountered by people, and will very rarely bite, which is what has made it such a popular pet. They will usually try to keep under cover where possible, as they are much more vulnerable in the open, and their prey such as mice and rats also tend to be found in areas with plenty of cover. Although the Red Rat Snake is generally a ground dwelling snake, they have been known to climb trees or cliffs in order to get to a more favorable position. This snake can be found from Florida in the east as far west as Texas, and is a very successful species of snake. Their preferred habitat is one which is on the ground but still offering plenty of cover and plant litter for them to hide in, so they will often be found in fields that have been left to grow, woodlands and also in some farm buildings. Those that are found in parts of the country that are quite warm throughout the year, such as in Florida, will become less active during the winter, while those in colder climes will actually hibernate. Reproduction And Growth Cycle - Because of the wide range of territories and climates that the Red Rat Snake can be found in, the species can have different cycles depending on the climate in which it is found. Each snake will go through a cooling period of between two and three months as it becomes ready for the mating season, which will usually coincide with the cooling of the temperatures in Fall and Winter. Following this process, the male will find a female and mate with her, and if she is ovulating then up to 24 eggs can be laid. Around ten weeks later the baby snakes will emerge from the eggs using their egg tooth, and at this point they are around five inches in length. Corn snakes will grow quickly for the first year, when they will come close to becoming adults, and will continue to grow at a slower pace after that, depending on habitat and the availability of food.